Meet Zebulon Sixkill in this Spenser detective novel, Robert B. Parker's last novel before his death. Having read almost all of Parker's Spenser novels, I read Sixkill curious as to how it compared to the other 40 novels in the Spenser series. I am glad to say that it is not a novel written with diminished capacity but contains the twists and turns, the humor and insights, and the action and introspection one comes to expect from reading the Spenser novels. Zeb Sixkill is a Cree Native American Indian and is a new character Parker introduced in his last novel. Parker follows a motif used in Early Autumn, an earlier (1980) Spenser novel, and has Spenser fill the role of role model and mentor for Sixkill. This was emotionally fitting for me, knowing that this was Parker's last novel before his passing, to see Spenser, now in middle age, passing on his knowledge and experience to another. As in other Spenser novels, the author also engages the reader in considering racial, ethnic, gender, and professional stereotypes--and their negative impact on the individual and society. And, as in his other novels, Parker also emphasizes how individual choice impacts previous experience to produce a tangle of opportunities and challenges in life. These tangled skeins of life experience and individual and societal limitations are the essence of Parker's novels, and in Sixkill he continued that tradition of clashing opposites to spin gritty plots and late-night firefights. Zebulon Sixkill--Cree Indian, football star, alcoholic, and man without a purpose--meets the guide for his hero's journey in this novel. How this meet-up between Spenser and Sixkill rolls out is the joy of this novel, filled with fists, wisecracks, and bloody death. 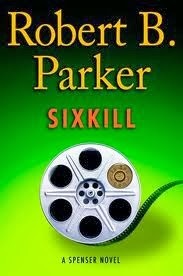 It is fitting that we wonder what Parker would have done with the character Sixkill in future novels. Would Sixkill have been a significant yet peripheral character such as Hawk, a character in many other Spenser novels? Would Sixkill have had the main role in his own series of crime novels, such as the characters Jesse Stone and Sonny Randall? Would Spenser eventually have retired to advise Sixkill as he younger man became a private investigator, allowing the end of one generation and the beginning of a new? That speculation is appropriate for the last Parker novel. At the last page, sentence, and word, we are satisfied with this episode in Spenser's life and also thoughtful--Parker, as always, simultaneously entertaining and enlightening.